Hello all!! Welcome to our second challenge at Paper Therapy. Paper Therapy is an online forum for scrapbookers and card makers to share their work, meet new friends, learn new tips and techniques and have fun!! I hope you can join us every week in our challenges! This week's challenge was to use the very first stamp that we ever bought, or the oldest stamp in our collection. Between fairly new to scrapbooking (or at least building my collection) my stamp is from a Halloween collection by Inkadinkado from 2008. This week the designers were challenged to make a project with the first stamp we ever bought or the oldest stamp in our collection. 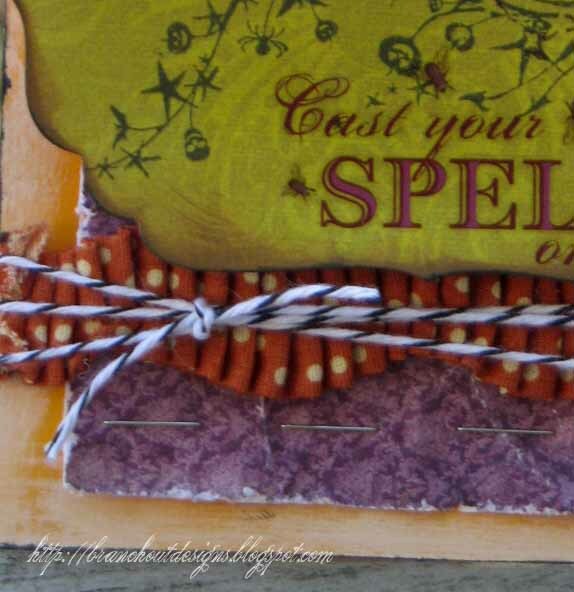 I haven't been stamping too long and I wanted to make a Halloween card so I pulled out my All Hallow's Eve set from Inkadinkado and my new papers and embellies from Pink Paislee's Hocus Pocus line to come up with this witchy little card. I stamped the image on some patterned paper, die cut it and then inked the edges. I distresed the edges of the patterned paper and then wrinked it up and sanded the creases. The Artisan Element from Pink Paislee was inked with ink. patterned paper to the card with staples. 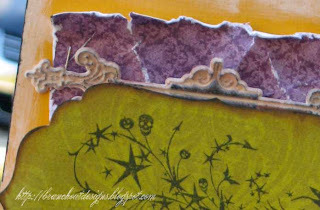 Patterned Paper: (Good Fortune & Skeleton Soiree from Hocus Pocus collection) Pink Paislee. Clear Stamps: (Witch from All Hallow's Eve set) Inkadinkado. Fibers: (Orange Polka dot pleated ribbon) Making Memories. (Black & white Baker's twine) May Arts. Accents: (Sentiment rub on from Hocus Pocus collection) Pink Paislee. (Artisan Element flourish) Pink Paislee. Other: (Label die) Spellbinders. (Cream paint) Delta. (Staples). What an awesome first stamp and that card rocks! I love it! LOOOOOOOOOVE it! Totally putting in my FAV file!! I also think I might use your LO/sketch for a card I want to make this week! LOVE LOVE LOVE your style;) FAB job, Emily!!! Gorgeous card Emily! The colors are great together, and I love that diecut shape! The layering is awesome too! Emily I love the distressing on this card. Perfect for Halloween. Your cards are always so inspiring! I love this card! Everything about it is great!! 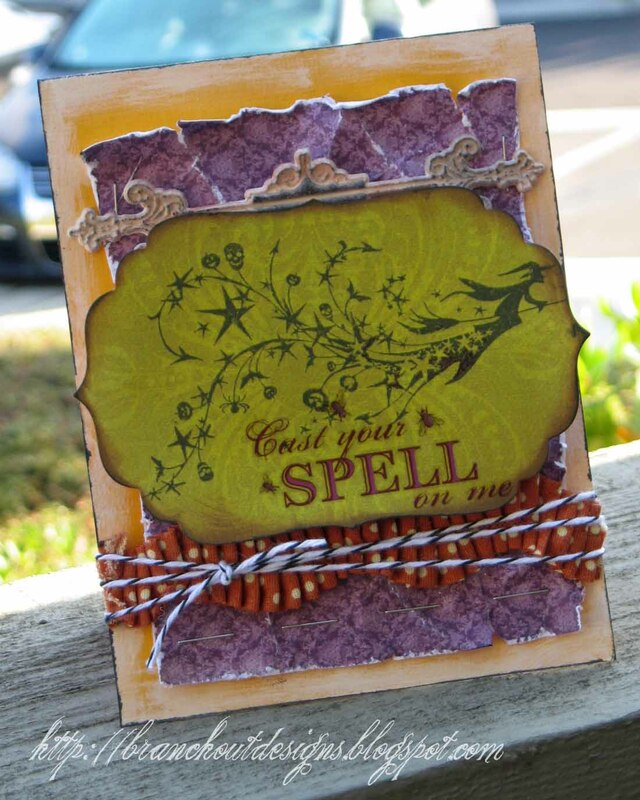 Your use of color and texture is amazing! Fantastic card! your card is just so beautiful I love the color combo. WOW! This is one amazing Halloween card, Emily! LOVE this!